Bear with us as we fill in details on the playlist and get the links working. You can download the show here if you'd like. **Phat Freestyle of the Week** Jerrell Johnson "Mike Tyson Punch Out Freestyle"
inDependency Tour Artist Spotlight - D-M.A.U.B. It's time to start showcasing the artists on the inDependency Tour that is stopping in Peoria, IL August 27th. Here is D-M.A.U.B. performing live at The Mad Frog's open mic in Cincinnati. Here's what Young Cut-T has to say about why he performs at the secular club ran open mics. Let's get hyped and tell everyone you know about this concert in Central, IL. As of right now, this is the only stop in Illinois that I saw on the schedule. I don't know about you, but we are getting really amped about this concert. Keep checking back for updates on K-Drama and Yaves the Street Pastor. For now, enjoy the video clips and his bio below. Donny “D-MAUB” Harper is Dedicated to Making All Underestimaters Believers......it’s what his name stands for. Like most thrown onto to the platform of ministering the word of God, this young man has seen his share of trials and tribulations. When his childhood friend, Robert “Lazarus” Smith pulled him aside and introduced him to Christ, Donny took the role full on. Tragically losing his mother in 1997, D-MAUB finally saw that there was more to life than what he had been doing. He accepted the invitation and started turning a skill he has always possessed to glorify God and spread his awesome testimony of coming through tough struggles. He wants people to know that we can have fun and draw men to Christ through his lyrics and beats. But most of all he desires to draw all to Christ. He’s also known as the #1 YOUNG “CUT-T” , which stands for Courageously Upholding The Truth. When D-MAUB talks, people listen, they relate, they think and things change!! D-MAUB has had the pleasure of ministering alongside national recording artists Nicole C. Mullen, Bootsy Collins, k-Drama, Karen Clark and Kierra Sheard, Electric Church, Mars Ill, Da’ T.R.U.T.H., E.Cross, and Tye Tribbett and G.A.. He also has submitted his voice to local commercials such as Deveroes clothing store. He participated the Queen City Fusion BET/Soundstage in 2004. D-MAUB has appeared on the Sony Playstation 2 games Grand Turismo 4, NBA Jam, ATV 3 and MLB 2005. Another piece of the vision came together in 2005 when Donny branched out and began his own label, One Route Entertainment. He and a group of dedicated friends have big things in store that include music, clothing and educational platforms. One Route Entertainment has been making strategic moves to achieve goals, most recently attending the 2008 Holy Hip Hop Awards and Artist Showcase in Atlanta, Georgia. D-MAUB is featured on the Holy Hip Hop :Takin’ The Gospel To The Streets Volume 4 Compilation for 2006 distributed worldwide by EMI Gospel. D-MAUB has released 4 albums, The Unexpected in 2002, Tymeline in 2005, Life Over Death in 2007, and both The Release and Urban Legend in 2008. In 2009 he presented “Crazytones”, the ringtone album, “Crazy Text Tones” and “The Follow Up” EP. D-MAUB was among the honorees for the 2009 Holy Hip Hop (EMI) Awards and Artist Showcase to be held every January in Atlanta, Georgia. He also acts and has been featured in the stageplays “Go Get Your Life Back” and “Secrets”. In October 2009 D-MAUB and One Route Entertainment secured national distribution with Dedicated Music Group/Universal Music Christian Group. He continues to work with local and national productions and participate in events both in and out of his hometown. Donny was born, raised, and currently resides in Cincinnati Ohio with his wife and children. June 17, 2011 Playlist - Happy Father's Day! Good afternoon Kingdom Minded people! First of all, Happy Father's Day to all the dads out there! This show is meant to glorify The Father and to honor you, the fathers. We're featuring some songs by several artists that were made especially for Father's day. I personally share a little bit of my testimony regarding my father and I's relationship. 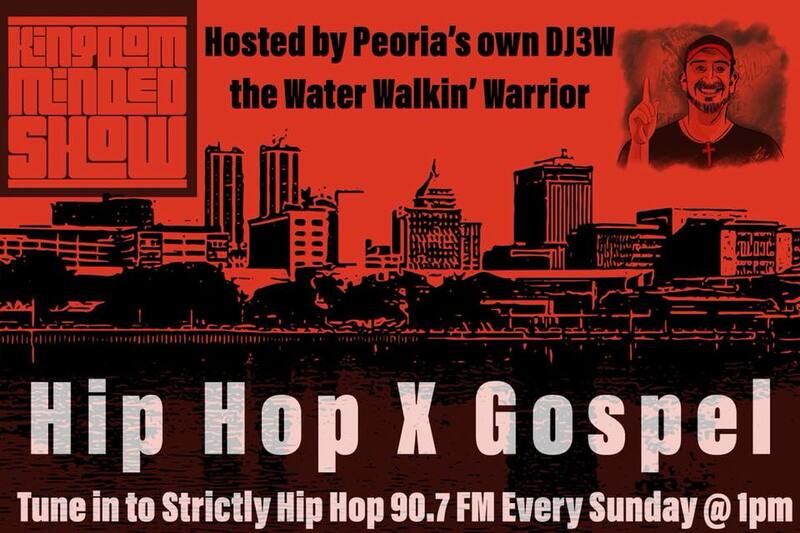 We also have new music by D-MAUB, Redd Lettaz, Kelly Kelz, and new to the show Aaron Mason. 7vnseal was selected to be the Phat Freestyle of the Week. Call us and leave a shout out or comment about the show at 775-375-KMRS. You can follow us on Twitter @KingdomMindedRS. Follow us as we follow Christ. You can download this weeks show if you would like. Just right click on the link and save as an MP3. If you would like to donate or sow into the show, please contact us at KingdomMindedRadio@Gmail.com. Go ahead and press play at the bottom of the page to listen to the show if you missed it. It's heartfelt and our prayer is that some healing would come from the spirit behind the music today. God can heal a broken heart and fix relationships. Here's the playlist for this week's show. Thanks for tuning in to the Kingdom Minded Show. We hope something was stirred up in you to be more Kingdom Minded. Here's the playlist for June 4, 2011 and also for June 11th, since we had some technical difficulties in the last hour before we could upload the new show. We've got some bangers coming up next week so stayed tuned for some new joints and a new phat freestyle of the week. Have a Free Download of the show! **Phat Freestyle of the Week** featuring L.A.R.O. We hope you enjoyed the show and more importantly, that you were inspired to be more Kingdom Minded! You've heard the interview with 7vnseal aka God's Dagger on the show. You've listened to the singles. 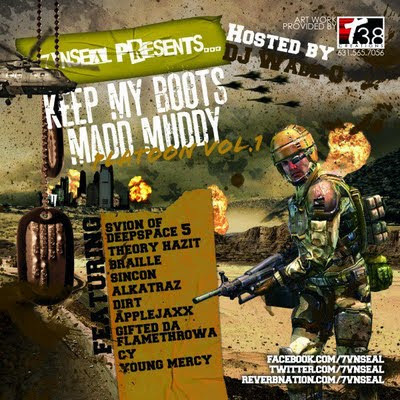 Now you can download the "Keep my boots madd muddy Platoon Vol. 1" mixtape yourself for FREE. This is some raw hip hop and ministerial music you should not sleep on. It is mixed and hosted by DJ Wade-O in an authentic mixtape style, packed with tight beats and filled with spiritual warfare and Christ-centered lyrics featuring some of the best artists in Christian hip hop. Click the cover and smack the devil in the face by downloading this project.